New 22" HC Capper to be on Display at Pack Expo in Chicago - US Bottlers Machinery Co. This year U.S. Bottlers will feature a 22” pitch High-Speed Capper (HC) in our booth (S-2914) at Pack Expo in Chicago. This model is the latest in capping technology from U.S. Bottlers and we are very excited to share it with the public at McCormick Place. 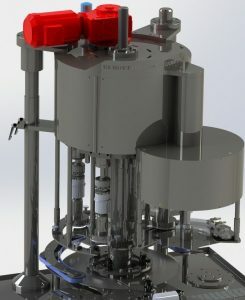 This model has the same elements that have made the HC design so successful, which include contained cam rollers, adjustable top-load and non-cogging hysteresis magnetic clutches, bottle base and/or neck support options, and easily-removable capping head assemblies. However, this particular model has a more compact footprint (22”) than previous HC cappers, which makes it a viable option for the customers who are targeting production speeds ranging up to around 400 caps per minute. If you would like to attend Pack Expo, please visit the registration page and use the promo code, 41X95 to receive free registration courtesy of U.S. Bottlers. We hope that you are able to attend this year’s show, and that you will pay us a visit so that we can share more about our company and equipment.